This article has the goal to start you the world of OOP PHP programming using the framework Yii version 2. This article is important for people who want to learn how to program in PHP with the correct way of using OOP while having a clean code using MVC design pattern. To achieve this goal, we are going to use Yii framework version 2 (Yii2), which is a high performance framework that has been highly used on the market. 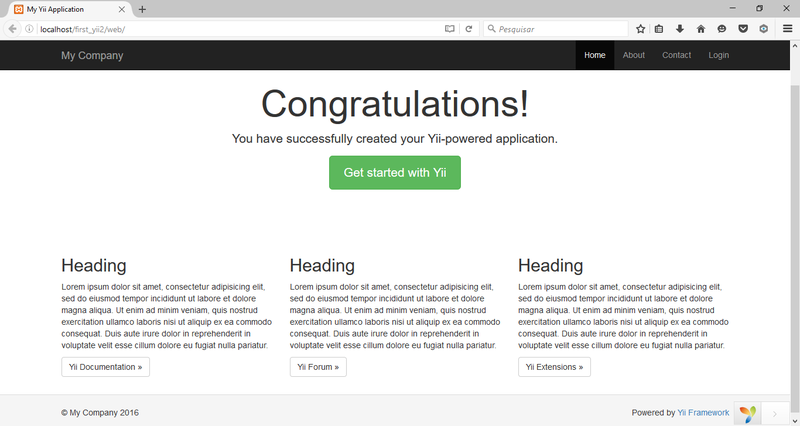 Yii2 framework enables you to build from simple to very complex web systems. It helps you to deliver more in less time, saving you a lot of time with its automation tool called Gii. Yii2 is a complete PHP high performance framework, but it is not part of PHP itself; so, we need to download the template in order to start a new project with Yii2. Said that, you need to know that we can use it in two flavors: basic template and advanced template. Each one of these templates are meant to be used in specific systems and needs. 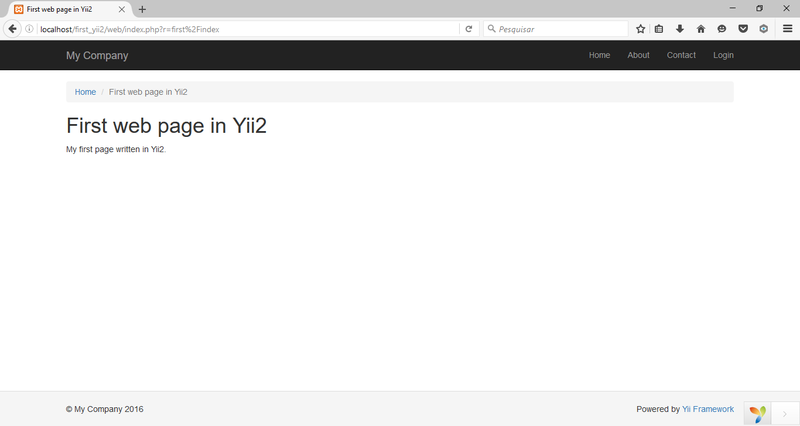 As we are learning how to work with Yii2 framework, we will be using basic template. Basic template is the best choice to the majority of projects, because it enables you to use all modern characteristics of web sites in a really simple way. Advanced template is the best choice when you are developing complex web applications. Its structure is based on three internal applications: front-end, back-end and console. These applications help when developing and deploying in different environments. There are two ways of installing templates in Yii2: 1) downloading the archive file (.tgz) directly; 2) using Composer to install. We are going to use the second option. You must change first_yii2 in this command line for your own project name before running it. When all download is done, your basic project is ready to use. If you have placed in the web server documents directory and your server is running, you could open your favorite web browser and access the site just created using the url http://localhost/first_yii2/web. You should see the same page in Figure 1. Now that you have installed the basic template, you are able learn what is the purpose of the directories that were created for you. But here we are going to show you the most important and used ones. Controller: It is a set of classes that controls the flow of the site. These classes are the entry point of functionality into the site and could or not render a View. The relationship of the MVC parts are shown in Figure 2. Here we are going to learn how to create a basic page from ground up. This page is really simple because the goal here is to show you how is the simplest process of creating a page. After you learn that, you could deep your knowledge much simply. Now, you can just access the page as in Figure 3. With this, you know the bases of Yii2 framework! Now you can start developing your own web applications while exploring the other framework resources by yourself. Don’t be shy and do whatever you want with this amazing PHP framework. Let’s rock!